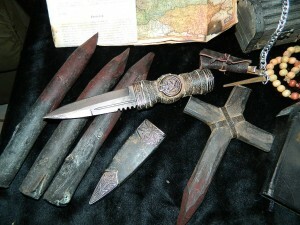 Here is one of CRYSTOBAL’s traditional style primitive vampire killing kits, Gabriella. This vampire killing kit has been created in the style that CRYSTOBAL’s made famous in the last few decades, the “hand made rustic” style that had never actually been made during the late 19th century. This is CRYSTOBAL’s own interpretation of how an 1800’s craftsman with limited resources would have created a kit with readily available materials. It also represents how the kit would have aged through years of use in the field. 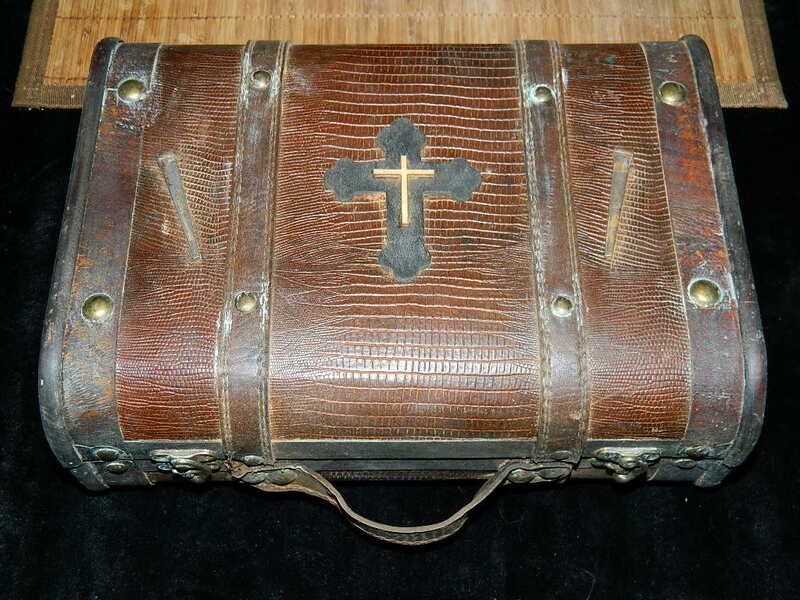 The exterior of the box is decorated with coffin nails and a wooden cross, and has been hand aged/antiqued by the artist to look as if it is over 100 years old. The box and contents are new, but are made to be authentic to the late 19th century. This Vampire Killing Kit is currently offered for sale on Etsy.